OMFG. Have you guys seen this book? It’s a frickin’ MONSTER. 1088 pages. 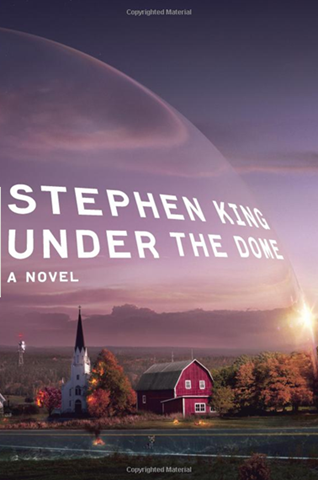 This is Stephen King’s recently release novel and it’s a whopper. Apparently, King’s been working on this book off and on since the 70s. It’s about a town that is essentially blocked off from the rest of the world. And apparently, without outside influences, the town goes gonzo on itself and weird and unpredictable ways. That’s about as much as I know about it since I haven’t read it yet. But that’s not why I’m mentioning it. Y’see there’s been this price war that’s been going on amongst the major book sellers Amazon, Barnes and Noble, Walmart, Target, etc. since it was released earlier this month, to price this thing down to… well… almost nothing. At most places you can get the hardback for less than $10. That’s right. 1088 pages of Stephen King for less than $10. What’s blown me away is that you can ALSO get the audiobook off of AUDIBLE.COM for only ONE SINGLE CREDIT. ONE CREDIT? WHAT DOES THAT MEAN? I first heard about this on the Windows Weekly podcast and I couldn’t believe it when I heard it so I had to go check it out myself. And yes, it’s true – you can get the entire audiobook for just ONE SINGLE CREDIT. It would normally sell for $27.99. One credit on Audible, when you become a “subscriber” is effectively about $10. To the lay person, this might not seem like a big deal considering the hardback version of the book is also going for $10, but for audiobook readers, we know that recorded readings are always 2x-3x times more expensive than the text versions. Also, keep in mind that someone had to actually read all 1088 pages ALOUD… and this took a whopping 34 HOURS & 29 MINUTES. On Audio CDs, this would consume 17 discs. Even on Audible, you have to basically download 5 media files to get the whole book and the total space consumed by this one book alone is about 1.0GB. I can’t say that I’ve ever seen a book this large before posted to Audible. Now, I’m not a monster fan of Stephen King. I’ve only read one or two books of his in the past but this thing is such an incredible anomaly in the audiobook world that I just had to burn a credit on it. Aeron lovers eat your heart out: I have an “Embody” chair! (I can’t help it. I gotta pitch this thing. 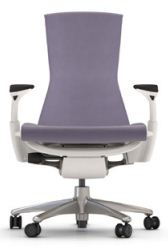 I’ve sat in a lot of office chairs – particularly the Aeron which was Herman Miller’s design that was all the rage during the Internet boom of the late 90’s. Dotcom start ups bought these by the hundreds of thousands to populate and furnish their new dotcom workspaces. Yes, the Aeron was comfortable, what with it’s mesh based fabric & it’s back shaped structure… it was practically designed for the uber-computer user. STIFF. The back felt stiff even with the mesh fiber. The fiber would bend and flex to your backs contours but it really had different amounts of pressure along your back and thus you felt more comfortable in some areas than others. LACK OF ELBOW ROOM. The fact was that your elbows were stuck either in front of your body on the arm rests, or directly at your side. Everyone knows that when you stick your chest out to stretch, your elbows need to be behind your body. No can do on the Aeron. THIGH SUPPORT. Weird as this sounds, on some chairs my thighs would ‘hang over’ the end of the chair. On others, the seat would be too big and I’d have to ‘scoot’ forward which is not ergonomic. FLEXIBLE BACKBONE. This is the weird part that’s fascinating. 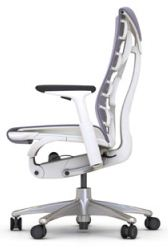 The chair actually has a “backbone” that flexes with your back’s shape. No longer are you dependent on the mesh to flex to the contours of your back. That still happens but now the back of the chair actually has joints that adjust to your back as well. We have some really crappy chairs at work and this one is so comfortable, I may ask my friend to order me another on my dime just so that I have one at home and at work for this feature alone. THIN BACK, OPEN ELBOWS. The back is much thinner allowing one’s elbows to poke out on the sides. This is a very natural feel that doesn’t make your chest feel cramped or your elbows feel confined. There’s a lot more freedom in the way your body fits the chair. EXPANDABLE BASE. 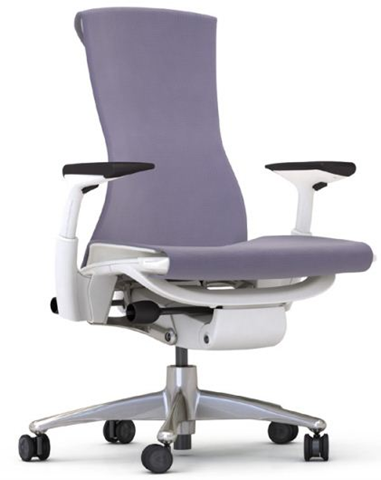 The chair’s seat literally can be elongated outward so that more of your thighs are supported by the base. This disperses more of your weight across a larger surface area lessening the pressure on any one part of your body. Like most professional office furniture, this isn’t cheap. But it’s definitely far an above anything I’ve sat in. I’m sitting in it right now wishing I had one for my office and the baby’s room. I could probably rock our son to sleep every night in this. America’s Favorite Shelter… can you throw us & our animals a bone? In a nutshell, our work with an animal rescue organization here in Los Angeles, and if you’d be so kind as to simply sign the petition/voting booth to get the rescue have a shot at $10,000 prize, we’d appreciate it. An very long argument broke out today over a distribution list here at Microsoft over a laid-off employee’s “last parting email”. He lashed out at various processes, technologies, traits, and even people of the company in a manner that can only be described as ‘unfiltered’. Now I’m all for feedback & criticism, but this individual’s email brought to light, through discussion, some rather interesting, and IMHO, important lessons about communicating & working with others in the workplace. I thought I’d summarize some of what was articulated based on a massively long mail thread that was written because I know I personally learned a lot. Being constructive in one’s criticism doesn’t mean they have to spin things in a positive light, but rather focuses on how to really improve something. With one’s constructive comments, the recipient should be able to take that feedback and make a clear decision on how to improve that something. What may seem obvious “objective fact” to you, is more often than not simply a personal preference and a “subjective opinion”. Emotion often blinds individuals to the fact that others may see things completely differently based on their personal work habits or valuable experience… experience that you, very often, do not have. 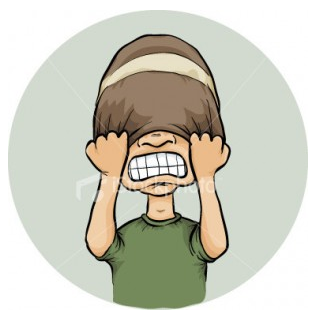 Everyone has the right to complain however the moment someone feels that they are being treated disrespectfully by said complainer, the game’s over. Mutual respect is of utmost importance to maintaining a harmonious work environment and in fact, making individuals feel respected is often a great tool to working better & solving challenges. Individuals that throw their arms up in defeat have ideas and beliefs that are lost to history. Meanwhile those that persevere with passion, conviction, and don’t lose heart are the individuals that change the world. Very often people find themselves referring to another organization or a management layer as “them” relative to “us”. I know that, to this day, I personally do this occasionally. This is a no-win trap because in the end, there is no “us” or “them: There is only “us”. And the success or failure of the company is dependent only on “us”. There is ultimately no ‘win’ if anyone fails. If you’re positive that your ideas are ‘better’, yet no one who has heard your ideas agreed, the only person you have to blame is ultimately yourself because you failed to communicate your ideas clearly with relevant rationales. When people argue with you, it’s often because they’re not clear about what you’re articulating. Other times, it’s not because they don’t agree with you, but rather they’re simply testing the strength of your ideas. Some people do flat out disagree with you, but it doesn’t mean they aren’t open to having their minds changed. Some may even indicate ways you can improve your arguments whereas you might misinterpret this as ‘not getting it’. You are currently browsing the Kurt's Thoughts blog archives for November, 2009.